Restrictions on religion around the world continued to climb in 2016, as more governments tightened controls on religious practices, populist parties increasingly used rhetoric to attack religious minorities, and the harassment of religious groups increased. A 138-page report by the Washington-based Pew Research Center into global restrictions on religion in 2016 – the most recent year for which data was available – surveyed 198 countries and territories. It ranked them according to their levels of government restrictions on religion and social hostilities involving religion. The report found that 83 countries (42 per cent) had high or very high levels of overall restrictions on religion – up from 80 (40 per cent) in 2015, and 58 (29 per cent) in 2007. Researchers said the increase was the second in a row. Divided into the two categories of government restrictions and social hostilities, the report found that the proportion of countries with “high” or “very high” levels of government restrictions – which it counted as “laws, policies and actions by officials that restrict religious beliefs and practices” – rose from 25 per cent in 2015 to 28 per cent in 2016. China, where President Xi Jinping’s government has said it wants to “Sinicise” religion, was found to have the highest ranking in this category, followed by Iran, Indonesia, Russia and Egypt. Myanmar moved into the “very high” category of restrictions in 2016 on account of its government’s brutal campaign against the Rohingya Muslim minority, Pew noted. While the proportion of countries with “high” or “very high” levels of social hostilities involving religion remained stable in 2016 at 27 per cent, the report found levels were highest in India, where Hindu nationalists have shown increasing aggression towards Christians, Muslims and other minorities under Prime Minister Narendra Modi. Behind India were ranked Nigeria, Egypt, Bangladesh and Russia. Some 11 per cent of countries had government actors who employed nationalist, and often anti-immigrant or anti-minority, rhetoric to target religious groups in their countries in 2016, up five per cent from 2015. 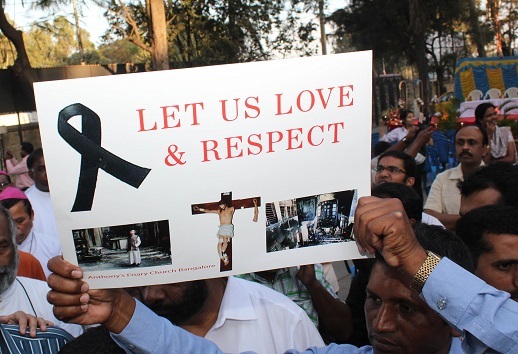 Christians were targeted by politicians using nationalist or anti-minority rhetoric in India, Nepal, Sri Lanka and the Philippines, while in Europe, the US and New Zealand, Muslims were the object of hostile rhetoric. And the number of countries where religiously motivated harassment was recorded jumped from 169 to 187 in 2015, the highest figure since 2007. Researchers said harassment could be committed by governments or social groups and included “physical assaults, arrests and detentions, desecration of holy sites, and discrimination against religious groups in employment, education and housing [and] verbal assaults”. Harassment increased against adherents of all religions. Christian groups were harassed in 144 nations (up from 128 in 2015), Muslims in 142 (up from 125) and Jews in 87 (up from 74), despite only representing 0.2 per cent of the global population. The report found that “Christians are harassed in more countries by governments (114 countries) than by social groups (107 countries)”.